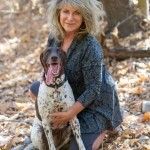 This impressive debut novel combines an appealing heroine, non-stop action, an exotic African setting, whip-smart humor, romance and fascinating science for an epic adventure worthy of Indiana Jones. 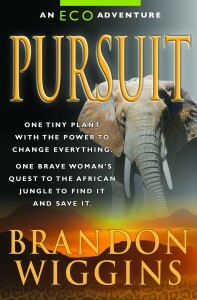 More than just another thriller, Pursuit weaves provocative and timely observations on women’s roles in the world power structure, the imbalance between our consumer culture and the well-being of the planet, and the correlation between the human condition and the natural world. Author Brandon Wiggins brings a wealth of knowledge of politics, science, nature and current events to this engrossing and entertaining work of fiction. 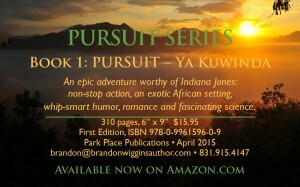 Let Pursuit sweep you away on an unforgettable journey from California’s Big Sur coast to an opulent San Francisco mansion, a luxurious corporate jet, the spectacular beauty and infinite peril of Africa, and finally to the corridors of power in Washington, D.C. Follow Skyler’s transformation from naïve graduate student to confident woman battling ruthless corruption at the highest level. Pursuit is a special tale that will keep you up all night reading—and will give you something to think about for long afterwards.